Bradley Prizes: Roger Ailes champions Fox News' Benghazi coverage. 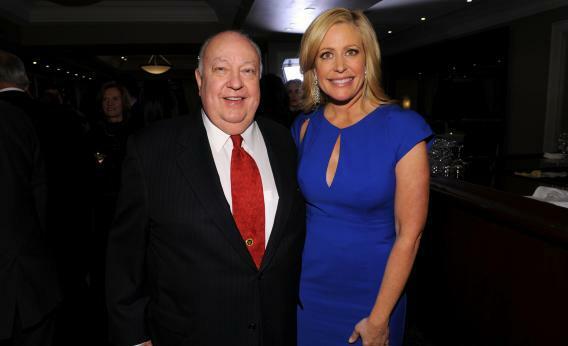 President of Fox News Channel Roger Ailes and Fox Business Network anchor Melissa Francis attend Francis’ book launch party on November 8, 2012 in New York City. Last night I joined a few hundred conservatives and a smattering of reporters to watch the 10th annual Bradley Prizes ceremony—the latest dispersion of $1 million to four intellectuals who’d done the movement right, offered by the deep-pocketed Lynde and Harry Bradley Foundation. This year’s recipients, $250,000 each, were Yuval Levin, Paul Clement (who joked about “the victory in the health care case” that the media gave him then took away), Mitch Daniels, and Fox News founder Roger Ailes. Ailes, by general agreement, was the show-stopper. He started onstage slowly, waving off a tuxedo’d attendant who offered to help him, and announced he was giving the prize to “charity for seniors.” He then unfolded a speech that, at first, consisted of corny jokes. “Behind every successful man is a surprised wife,” he joked, beginning a round of jokes about the sexes. That was the silly part. Soon Ailes got to the real-talk portion of his text, delivering it with flashes of real passion. When he finished, some Fox News employees in the room, like White House correspondent Ed Henry, gave him a standing ovation. The remarks are below. My remarks tonight are my own. They don’t necessarily reflect the views of News Corp, Rupert Murdoch, or Fox. I will say, however, that I didn’t give up my citizenship to run a news organization. So I speak here on the highest authority and greatest title anyone could aspire to: Citizen of the United States. We must stop waving our extended arms in an effort to balance ourselves as we tiptope along the edges of the Constitution in an effort not to upset weak-kneed appeasers with our belief in the ideas and principles that made our country different, and yes, better. Are we losing our country to the inevitable unrushing ties of history? No. But we’re in a storm. The mast has broken. The compass is off. And there’s a big damn hole in the boat. We have allowed ourselves to be manipulated by others, many of whom want to impose their culture and laws under the manufactured utopian idea that all cultures are equal, and most are better than Americans. Of course more people should be proud of their heritage. They should teach their children to be proud of their history, and their traditions. And they should be welcomed in America. But America is a culture. It has a culture. And it must be recognized. America is losing its historical literacy. Recently, 556 seniors were surveyed in 55 of the nation’s top colleges. Only 60 percent placed the American Civil War in the second half of the 19th century. Only 34 percent identified George Washington as the American general at the battle of Yorktown; 34 percent thought it was U.S. Grant. Seventy-eight percent of the institutions polled, no history whatsoever was required in the undergraduate program. Historian David McCullough said, we are raising a generation of young Americans who are historically illiterate. If the hole in the boat is to be fixed, it will require the tenacity and the ingenuity of the founders. Each of us must take the time to teach the journey of liberty and justice. We must not allow our collective memory to fade, or morph into trendy revisionist versions of political correctness which becomes a substitute for the truth. Traditional American culture influenced us when we created the Fox News channel for Rupert Murdoch. We know that a fair and balanced news channel could succeed as long as no views were rejected and conservative views were allowed to be heard. The Fox News channel just finished its 137th consecutive month in first place in cable news. The top 13 programs in cable news are all on the Fox News channel. One reason is, we cover the news. But we also cover stories that we know others will not like, like the abortion doctor in Philadelphia who was actually killing babies after they were born. We covered Benghazi when four Americans were killed, even though no other network would touch the story. It’s important because it involves over 200 years of military ideals. You see, if we ask you to go out in the night, and risk your life for America, we promise we will backstop you and try to get you out of it as far as humanly possible. In Benghazi we did not do that. I’ve come to the conclusion I don’t really care what the President of the United States was doing that night. However, I would like to know what the commander-in-chief was doing that night. A few other hot news topics these days include the IRS. The federal government is about to hire 16,000 more IRS agents to enforce health care. Forty-seven new tax increases! No wonder they need guns! We already know the IRS is arrogant. They waste as much money as other government agencies. They enjoy pushing people around. And they can’t line dance! We don’t need 16,000 more people who can’t line dance. And we don’t need more people with guns enforcing our health care! Hi, granny, get your hands up, we’re tired of telling you this, but take your Metamucil. Regardless of your political party, here are some things we should all agree on. Government must reinforce the value of the individual and life. Government must have policies that help individual independence flourish and not reinforce dependency. Votes must not be purchased by corrupt organizations or individuals on false, vicious. Freedom cannot be compromised anywhere. Anti-Americanism needs to be answered in every place, every time, by each one of us. I mentioned earlier that American culture is unique and must be included in the whole discussion. It is America that has fed and freed more people than all other countries on earth. You know how I know this is a great country? Because everybody’s trying to get in, and nobody’s trying to get out. Correction, June 13, 2013: This post originally said Ailes’ joke was about a woman who didn’t “come over” one night.